On my way out of the United States, I picked up the April 2012 issue of Men’s Fitness. 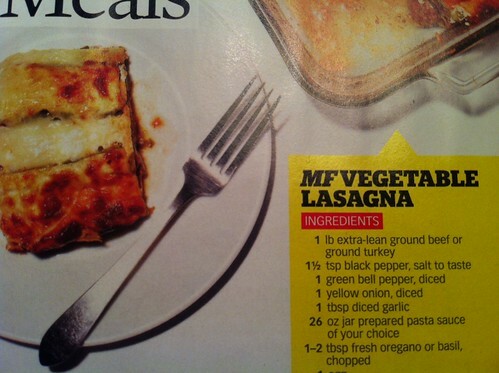 Don’t you also need lasagna as an ingredient? Well…it doesn’t say “vegetarian “, but is kind of misleading , unless the government has decided that beef and turkey are vegetables now. They’re always changing things! Reko – Upon examining the rest of the recipe more closely (the part I didn’t photograph), the answer is no. I think you use zucchini as a substitute for the actual lasagna part. I made vegetarian lasagne last week with stewed zucchini , spinach and carrots as a meat substitute. Yum!